Our small family run holiday location is the perfect place for you and your family to escape the stresses of day to day life. Situated in the tranquil north of the Lake District National Park, nestled within the Caldbeck commons, with uninteruppted views of the Skiddaw range to the south and the Solway Firth and Scotland to the north, it's the ideal base for exploring. From hiking up the majestic lakeland fells, cycling along the scenic country lanes, to relaxing by the fire in a local pub - the posibilties are endless. This is a wonderful area for walking, cycling, touring, or just relaxing. 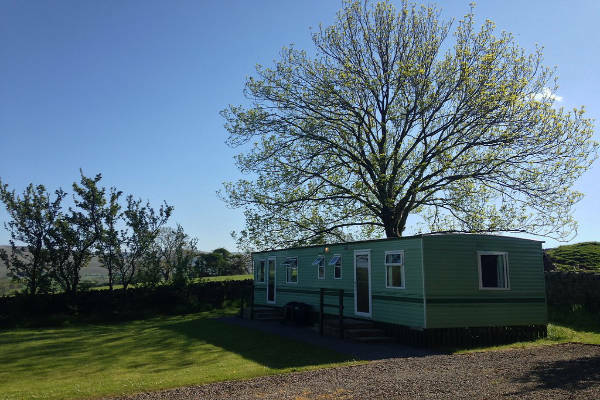 At Brownrigg Hall we have two static caravans - both with full central heating and double glazing. They have magnificent views towards High Pike, Carrock Fell, and the villages of Caldbeck and Hesket Newmarket. Please note: We are unable to accommodate any animals and we do not allow smoking in any of our caravans. Both come equipped with everything you would expect for a self-catering holiday. They offer comfortable accommodation for four - double and twin rooms, a separate shower room and WC. The modern kitchen/diner features a full size gas hob, oven, grill, microwave and fridge, along with all the usual amenities. The spacious lounge has comfortable seating, a gas fire and flat screen TV - The perfect place to relax after a day out in the lakes. As you travel along the unfenced fell road, you will be drawn to the wonderful views; to the North is the Solway coast, and beyond to Scotland. To the North East is the Border country, Hadrians Wall and the historic capital city of Carlisle. [magnificent castle & cathedral]. East to Alston (the highest market town in England), south overlooks Caldbeck village, & northern fells of the Lake District National Park. Please contact Joyce for futher information. Lovely caravan, had everything we needed - perfect for our stay. Saw lots of different birds which we don't see where we live. We did the “Howk” walk round the village [Caldbeck]. We had a really lovely, relaxing week. Accommodation very comfortable and well equipped - excellent heating for the evenings. Excellent base for cyclists and walkers - very quiet lanes this side of the lakes and hills. Will certainly return. If you prefer you can give us a call on 016974 78268 or email us at info@brownrigghall.co.uk.